July 31 is National Raspberry Cake Day. This food holiday is a good excuse to indulge yourself with a slice of delicious cake, either homemade or store-bought. Raspberries are harvested from late July to early September, no wonder National Raspberry Cake Day is celebrated on July 31. 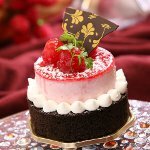 Although raspberries are available in supermarkets all the year round, raspberry cake is especially delicious when it is made with fresh, ripe, juicy raspberries of the new harvest. To celebrate this holiday, try your hand at baking raspberry cake and treat your family and friends to this delightful dessert. Here is an easy recipe for you. In a large bowl, whisk together 2 cups all-purpose flour, 1 tbs baking powder, and 1/2 tsp salt. Set aside. In another bowl, cream 1/3 cup softened butter and 1 cup sugar until light and fluffy. Beat in 1 egg, 1 cup milk, and 1 tsp vanilla extract. Add flour mixture alternatively with milk mixture, beating well. Spread the dough into a greased baking dish. Spoon 3 1/2 cups raspberries over top. Preheat oven to 350 °F. Bake for about 30 minutes. Cake is ready, if its center springs back when lightly touched. While cake is cooling, make the glaze by combining 1 1/2 cups confectioners' sugar, 2 tbs milk or cream, 2 tsp melted butter, and 1 tsp vanilla extract. Spread glaze over cake.